- Whose Deficit is it Anyway? - What's in a job? 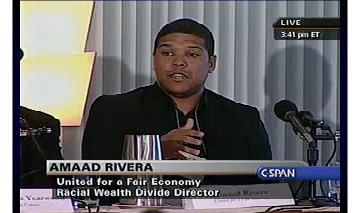 Watch the discussion on C-SPAN Video Player. "WHAT do you get when you combine the worst economic downturn since the Depression with the first black president? A surge of white racial resentment, loosely disguised as a populist revolt. [...] According to a 2008 report by United for a Fair Economy, a research and advocacy group, from 1998 to 2006 (before the subprime crisis), blacks lost $71 billion to $93 billion in home-value wealth from subprime loans. The researchers called this family net-worth catastrophe the “greatest loss of wealth in recent history for people of color.” And the worst was yet to come." Barbara Ehrenreich and Dedrick Muhammad of the Institute for Policy Studies cite UFE's State of the Dream 2008 in this New York Times op-ed. "For many Americans, the recession officially began in December 2008, but recent studies show it began much earlier — and had a greater impact — for minorities. [...] 'In communities of color, this has been happening for a long time,' Huezo said. 'For these communities, it is not a recession anymore; it is a depression.'" Includes mention of UFE's State of the Dream 2009, and commentary from co-author, Jeannette Huezo. Read the full article on StateNews.com (Michigan State University). "Reform of our broken health care system should not be considered an option, but a responsibility we all have to meet our highest ideals as a country [...] Providing access to quality, affordable health care for all people is a means by which we can put these ideals into practice." Read the full article by UFE's Mazher Ali in the Pocono Record. "Every year, we celebrate Labor Day to honor the work of everyday Americans who built this country brick by brick, community by community [...] With a comprehensive strategy for rebuilding our middle class, we can do more than pay lip service to the work of Americans on Labor Day. We can instead genuinely and honestly show our commitment to honoring the work of all Americans by passing policies that help lower and middle-income Americans share in the nation’s prosperity." Read the full article by Brian Miller in the Augusta Free Press. "Crisis. Downturn. Recession. Deficit. War. Disaster. These words are becoming all too familiar to many of us. And there is little in the way of optimism to offer. While some of us are only starting to feel the impact of the current economic situation, there are many who have been waiting for signs of hope for a long time. [...] once we collectively adopt a “people first” mentality, it will be in those moments of disaster, moments where we have historically fallen short, that our potential will be realized." Read the full article from United Methodist Women's Response magazine. "As A. H. Bill reminds: 'The richest 225 people in the world today control more wealth than the poorest 2.5 billion people. And... the three richest people in the world control more wealth than the poorest 48 nations.'... " Welcome Brian With A Gift Today! Today, we begin a new era in our fight for a fair economy – Brian Miller has arrived to begin his work as the new Executive Director of UFE! We're looking to raise $5,000 to welcome Brian. Please make a gift to UFE or Responsible Wealth today to help us reach our goal. Much has changed since UFE started raising awareness of the dangers of growing economic inequality during the Clinton administration. Today, more people than ever before are aware of and concerned about the extraordinary economic divide in this country. Even George W. Bush acknowledged the troubling growth of inequality in 2007. Today, greater equality is possible, but it requires a sustained and vibrant movement to fight for it. Thanks to your support, UFE has been the organization building and supporting that movement since 1994. Brian is ready to lead UFE forward in this critical moment. He is a community organizer from southern Louisiana who, for the last twelve years, has led a growing economic justice organization working for fair taxation in Tennessee. He has the experience and vision to make incredible contributions at UFE. Please join us in welcoming Brian by making a secure online donation to UFE today. Any gift will help toward reaching our goal of raising $5,000 by next Friday. Please make as generous a contribution as you can afford. "In another time of national crisis and hope for recovery, people with the highest incomes were taxed at nearly 90 percent — the effective tax rate in the decade following WWII. A key social value was that workers and families deserved broadly shared prosperity and sharing wealth more equitably was a way to get there." Follow the discussion on Rep. Brownsberger's website. "Households with incomes over $250,000 have saved more than $700 billion from the Bush tax cuts of 2001 and 2003. The proposed graduated surtax under the House Ways and Means Committee’s healthcare plan would take back $544 billion over the next 10 years, providing about half the cost of the entire plan, calculates the Joint Economic Committee of Congress."